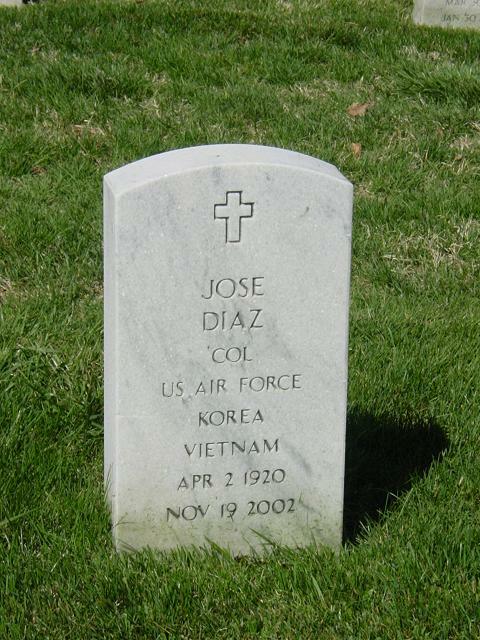 Jose Diaz, 82, an Air Force Colonel who retired in 1966 and did consulting work for what became the Energy Department and for History Associates Inc. in Rockville, died November 19, 2002, of congestive heart failure at Brighton Gardens nursing home in Bethesda,Maryland. Colonel Diaz joined what was the Army Air Forces in 1942. He served in the Pacific Theater during World War II as a P-51 Mustang fighter pilot and participated in an air raid on the Japanese mainland. He later was a B-29 Superfortress and B-50 Superfortress aircraft commander with Strategic Air Command. His final active-duty assignment was at the Pentagon as an assistant to General Curtis E. LeMay, chief of staff of the Air Force. Colonel Diaz's decorations included the Distinguished Flying Cross and the Air Medal. He was born in Tucson and grew up in Prescott, Arizona. He attended California Institute of Technology and the National War College. He moved from Annandale to Brighton Gardens earlier this year. His wife, Ada Diaz, died in 1999. Survivors include a daughter, Bonnie R. Kalberer of Bethesda; and a sister. On Tuesday, November 19, 2002. Husband of the late Ada E. Diaz; loving father of Bonnie R. Kalberer; father-in-law of Richard D. Broadwell; brother of Irene Blancet and her husband, George. Graveside services to follow at Arlington National Cemetery, 1 p.m. followed by a reception at 2 p.m. at the Officers Club at Fort Myer. Contributions may be made to the Alzheimer's Disease and Related Disorders Association.